Now, if you were ever the kind of person that outright refused to believe in supernatural or paranormal figures, you might want to think again. Why? 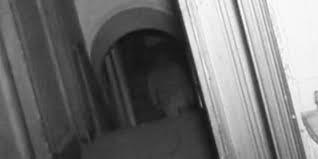 Well, the crew behind the paranormal reality TV show, Most Haunted, has apparently caught an actual bona fide ghost on camera. The footage was recorded at Wentworth Woodhouse stable block in Yorkshire, England where they were investigating the scene for potential ghosts. The stable block was built all the way back in 1630 by Thomas Wentworth, the first Earl of Strafford. So how did it all go down? Well, one member of the crew and one of the cameramen heard footsteps and the cameraman promptly ran in the direction from which the noise was coming. In a slow-motion playback, an indistinguishable male figure is seen on the steps. Naturally, many of the viewers were skeptical about the so-called ghost sighting and some speculated that it was merely a member of the crew dressed in a hoodie. Yvette has described the moment she saw the ghost for the first time, explaining that she was so overwhelmed that she ended up “bursting into tears”.